It was cold and windy all day but crystal clear. Everyone tells us the cold and wind is unusual. First let me show you our home for the next two months. 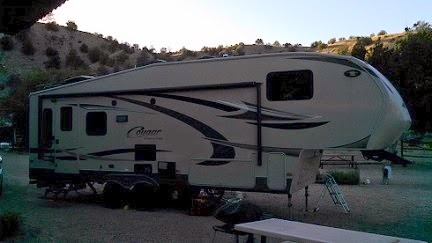 We are in the Apache Kid RV Park. We spent the day setting up and settling in. 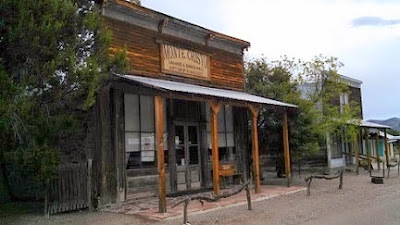 All of these buildings have a history different than their current life. I'll explore each in later posts. My major accomplishment today was getting Old Glory flying. That makes any place home. Dona took Michelle to show her what the rental cabins are like. Very nice inside. 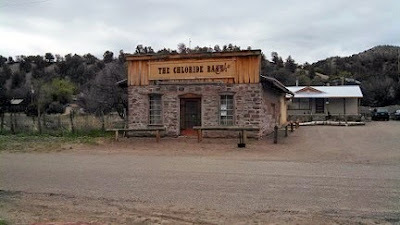 Chloride sits on the edge of the Gila National Forest. 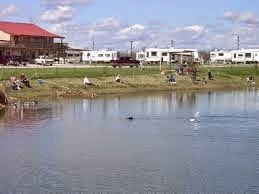 People come here as a base for outdoor adventures: hunting, hiking, ATV riding, climbing, exploring. Every day has to have a learning experience. Today we learned that the nearest laundomat is at the General Store in Winston three miles away and that we have to use our own shower. Uhh Ooo, there goes Michelle's second wardrobe closet. Now we are really roughing it. Today's trip was a short 144 miles. We were lazy and didn't get started until 1000. We finished the trip, including a lengthy stop at Walmart in 4:15. During our short ride, our trip odometer passed through 2,000 miles. Yesterday, I mentioned the fact that our overnight stop was in a neighborhood of "agricultural wealth". Today on our way back to I-10, we passed through the other neighborhood. Here were the houses of the farm workers that made that wealth possible – not a pretty sight. We said goodbye to I-10 after a short distance. In Las Cruces, NM we switched to I-25 for the rest of the trip north. Our last city was Truth or Consequences, NM. Yes, that is a real city and here is the story of how it got its name. 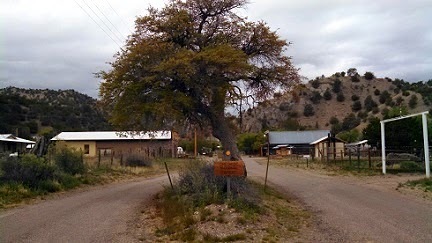 Truth or Consequences is the county seat of Sierra County, New Mexico, United States. In 2012, the population was 6,411. It is commonly known within New Mexico as T or C. It has frequently been noted on lists of unusual place names. 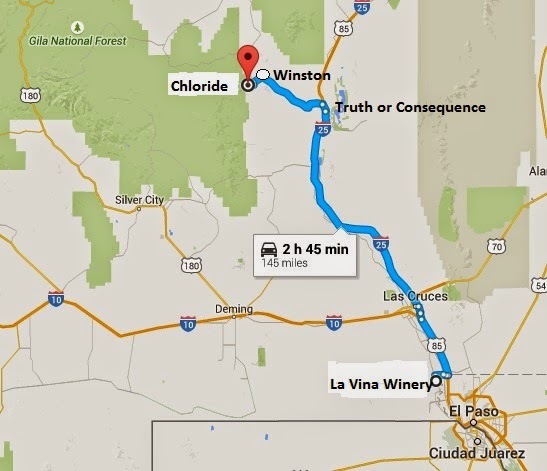 Somewhere the literature about Chloride says the nearest Walmart is 40 miles away (we clocked it to be 37.7 miles). Taking that as a warning we stopped at the Walmart in Truth or Consequences to do a major grocery and gas fillup. We later learned that the locals refer to the town as "T or C" and so do many of the road signs. 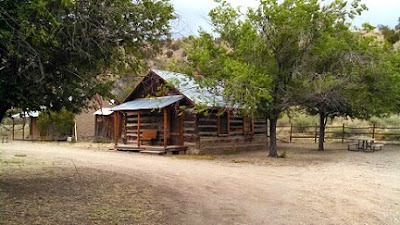 The last 40 miles (or 37.7) were brutally winding roads west into the mountains. Almost there, we stopped at the General Store in Winston to verify directions and to check out the store. 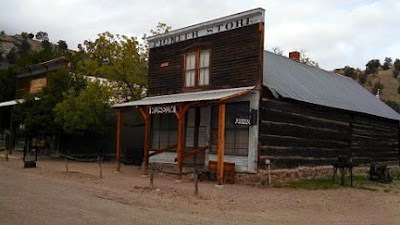 It is a real old fashion general store and I'll get back there soon to investigate further. About 1415 we arrived in Chloride. I knew we were there when I saw the Hanging Tree ahead in the center of the road. 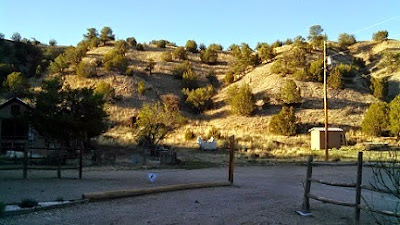 The little sign says "Chloride National Forest"
Don Edmund, the owner and our host, drove out to meet us as we arrived. He greeted us warmly and showed us to our campsite. In a few minutes his wife Dona and daughter Linda came to meet us and we chatted for a bit. We did our initial setup. I'll finish tomorrow. Seven days and 2,095 miles of travel. Two very tired travelers went to bed early. Today's travel covered 258 miles which we did in 7:20. 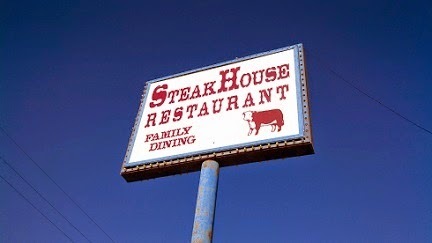 We pulled out at 0900 but stopped almost immediately for breakfast while still in Ft Stockton at the Ft Stockton Steakhouse. 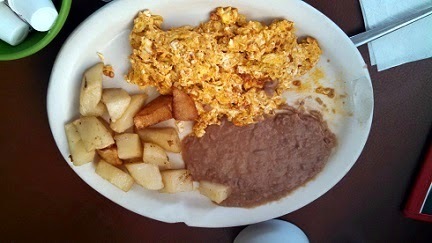 This time I had the Chorizo & Egg and Michelle had an omelet. Our travel direction was WNW until just before Ft Hancock, then NW along Mexican border to El Paso. That black line on the map is the US/Mexico border. Today we crossed into the Mountain Time zone. We'll stay in this time zone until October. 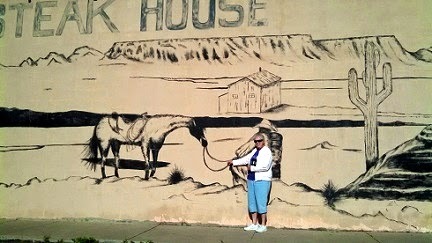 El Paso, TX of song and story fame was a grubby, lawless border town with mexican music, pretty senoritas, and gunfights. I'm sure some of that is preserved somewhere as "Historic El Paso". 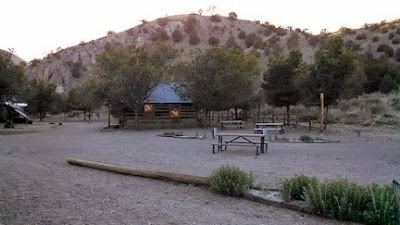 But now El Paso is a sprawling metropolis with big buildings, freeways, and traffic jams like every other big city; and a terrifying driving experience for RVers like us who have become used to the slower pace of senior living in the country. 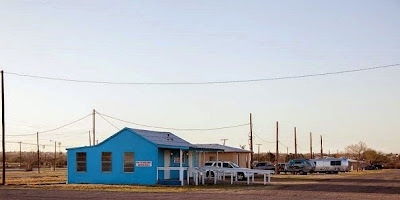 It is still a border town, squeezed between Mexico on the south and New Mexico on the north and west. El Paso suburbs are in a different state and a different nation. What a nightmare that must be. Our overnight stop this time was in Anthony, NM; one of those New Mexico suburbs, at La Vina Winery, another Harvest Host site. After we left the highway and got on to the back roads approaching the winery, I was struck by what I will call "agricultural wealth". Mile after mile of meticulously manicured vineyards and pecan orchards (read no weeds) spotted with very expensive homes. Also visible were elaborate irrigation systems. I'm pretty sure the water source is the Rio Grande which runs south through this region before it turns southeast and becomes the dividing line between the US and Mexico. We arrived at La Vina Winery about 1530 Mountain Time, stopped in the store to introduce ourselves and get directions to our parking location. 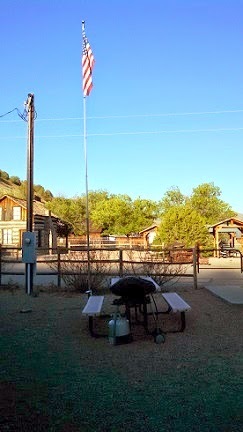 Then we set up for the night. After getting setup, we returned to the store and did a wine tasting. Each of us got five samples, with crackers and a free wine glass (glass not plastic) for $5. Of course we bought a couple bottles. I just had to copy this information from the Wine Tasting list. This is to impress you with our wine sophistication and my ability to create a table in a blog post. Are you impressed? Bob Off Dry Viognier French variety. Mineral and white peaches hints. Bob Dry Red Sangiovese Earthy spicy black cherry flavor. Origins in Northern Italy. Bob Dry Red Dolcetto Lighter bodied red wine with hints of cherry. Pairs with pizza or spicy dishes. Bob Dry Red Primitivo This zinfandel clone is fruity with medium tannin, spice, and pepper flavors. Bob Semi–sweet Oro Loco "Crazy Gold" Muscat blend with lovely citrus notes. Great for a picnic. Michelle Semi–sweet Rojo Loco "Crazy Red" blend of Ruby Cabernet and Zinfandel – some liken it to Sangria. Michelle Semi–sweet White Riesling Hints of strawberry and rasberry – perfect with bread and sharp cheese. Michelle Semi–sweet Gewurztraminer Fragerant white wine, pear and peach flavors with honeysuckle hints. Michelle Sweet La Dolce Vina Sparkling Muscat with spectacular citrus and floral notes. Michelle Sweet Late Harvest Viognier Apricot and honey characters and sweet mouthfeel balanced with soft acidity. A young man came into the store. One look and you knew he was a GI; the walk and the haircut give it away every time. We got into a conversation and learned his name was Matt. He is a soldier stationed at Ft Bliss. He came to the winery to buy some wine to send to his mother and sister for Mother's Day. We chatted while the winery clerk packed up his selection for shipping. He knew nothing about wine; neither do I. So I treated him to a wine tasting. He is unhappy in his job and with the anti–education attitude of his fellow soldiers. Nearing the end of his enlistment, he plans to leave the service return home to Sacramento, CA and finish college, then maybe rejoin the military. We wished him well. Soon the winery store closed and all the customers and workers were gone. We enjoyed a quiet evening alone in the parking lot. As it got dark, we could see in the distance the lights of the traffic on I-10 and the glow in the sky from the city of El Paso. Another day in the books. Our route today covered 336 miles which we did in nine hours. Leaving San Antonio we started the day travelling through Texas Hill Country. The Texas Hill Country is a twenty-five county region of Central Texas and South Texas featuring karst topography and tall rugged hills consisting of thin layers of soil atop limestone or granite. In recent years, the region has emerged as the center of the Texas wine industry. 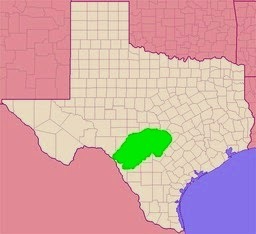 Three American Viticultural Areas are located in the areas: Texas Hill Country AVA, Fredericksburg in the Texas Hill Country AVA, and Bell Mountain AVA. Proceeding west the landscape changed to west Texas desert. Raw and unforgiving. Fort Stockton is a city in Pecos County, Texas, United States. 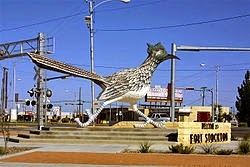 It is the county seat of Pecos County, located on Interstate Highway 10, U.S. Highways 67, 285, and 385, and the Santa Fe Railroad, 329 miles northwest of San Antonio and 240 miles east of El Paso. The population was 8,535 at the 2010 census. 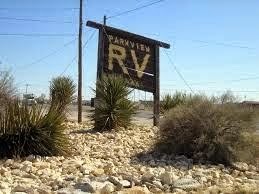 Parkview RV Park, our stop for the night, was really bad news. This is a Passport America park. The whole park was run down and the bathrooms were filthy. When I logged into the Passport America to rate this park, I found that they do not offer an opportunity to do ratings on their parks. Buyer beware. More on bathrooms in a later post. I needed a shower. Gritting my teeth, I used theirs. Every day can't end gloriously. Today was a planned tourist day. For both of us it has been over 50 years since we were part of the San Antonio "Sea of Blue". That is Air Force recruits at Lackland AFB. San Antonio has changed a lot since that time, as have we, plus as recruits we didn't get to see much of the town anyway. Our first stop was breakfast. 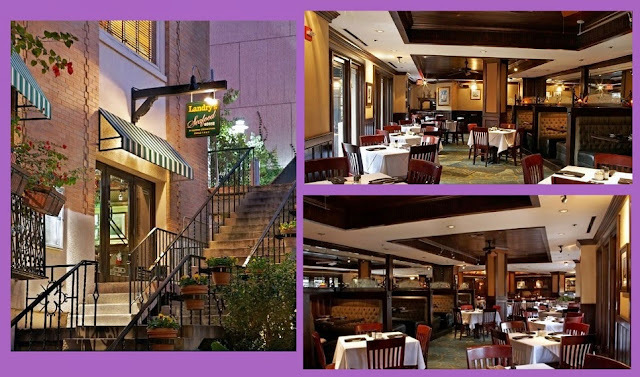 Our usual question is "Where do the locals eat?" 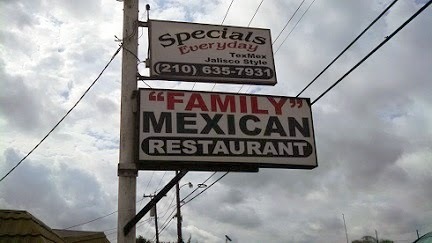 To that the RV Park manager sent us to the Family Mexican Restaurant not far from the park. 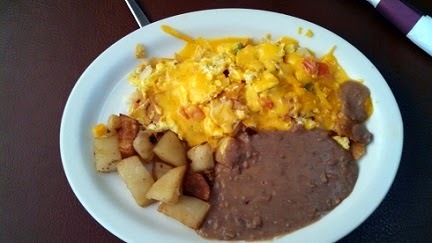 For breakfast, I had Migas – Diced corn tortillas, mixed with eggs, onions, tomatoes, hot peppers, and cheese. Served with potatoes, beans, tortillas. Michelle had Chorizo & Egg. That is a favorite of our friend Jim Leibold, so we thought of him as she enjoyed it. How do you toast someone at breakfast? 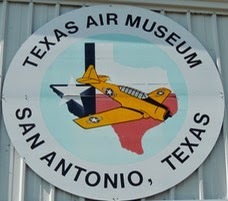 Our first tourist stop of the day was the Texas Air Museum. This is a Harvest Host site and we had intended to overnight there. Even though that didn't work out, we still wanted to see the place. 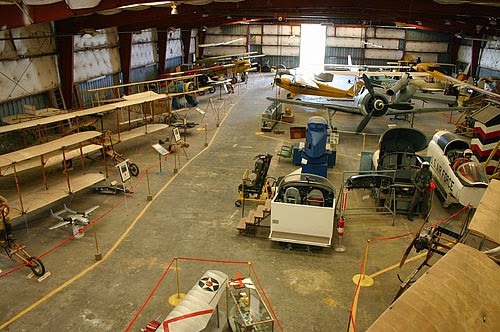 We spent a couple hours looking through exhibits and memorabilia from the early days of military aviation. Since San Antonio was central to Army Air Corps and early Air Force history, they have a lot of stuff donated by retirees and descendants who had selected San Antonio as their retirement location. A military aviation history buff could spend a couple days prowling through here. While we visited, we met Ked and Lee, two of the volunteer caretakers, and enjoyed conversation about old airplanes and the old Air Force. Alas however, this museum desperately needs some tender loving care and a major infusion of cash to make it a real tourist attraction. Good luck to them. 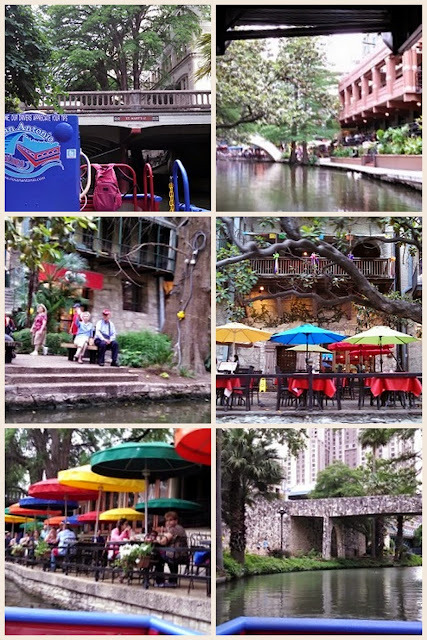 The biggest attraction in downtown San Antonio is the River Walk, so we had to go there. Way back when, it was a couple Mexican restaurants on a dirty river. Years of hard work and a lot of money have made it into the centerpiece of downtown, maybe more that the Alamo. Getting there involved big city driving and parking. Taking our truck downtown brought back not so fond memories of times and places past. However we made it and parked in the Market Street Garage. The best way to see the River Walk is to take the boat ride, so we did. A fleet of tourist boats is operated by Rio San Antonio. There are numerous places to buy tickets ($6 per person) and board the boats. The tour lasts about 45 minutes. The River Walk is all restaurants, sidewalk cafes, and upscale shops. It is easily accessible from just about every street in downtown by descending a well marked flight of stairs. Selecting a place for dinner was tough; there are so many choices. 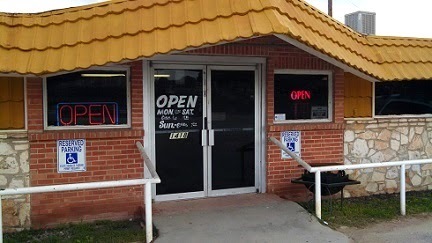 We finally settled on Landry's Seafood. It was just a short walk from where we had gotten on and off the tour boat. Memories. Are humans the only creatures with memories? Our military years are so far back they blend with childhood. Seeing the uniforms we wore displayed on manikins in a museum is not a comforting sight. In my post military professional life, I had a full wardrobe of suits, business shirts, shoes, and a large collection of neckties. I left the house every day well dressed and was quite at ease going into expensive restaurants and ordering from complicated menus. All of that is behind. 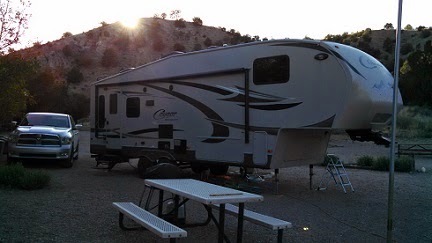 We roam the country in our RV and my wardrobe is shorts, jeans, and T–shirts. The most formal I can do now is a golf shirt and slacks. Going into Landry's where they had cloth tablecloths and napkins was uncomfortable. Do I miss the past? Sometimes. Would I go back? No. Life is a one way street and I think it is best that way. If you look at the banner across the top of this page, you'll see links to the RV blogs I follow. Nick Russell's Gypsy Journal is my favorite. I try to read it every day. His latest post "A Bad Way to Start The Day", posted in the early AM today (Tuesday) captured the misadventures of some RVing friends out on the road on Sunday and Monday. It seems like the road gremlins were out doing their mischief big time. Sunday was not a good day for my RVing friends. Al Hesselbart, retired historian for the RV Museum in Elkhart, Indiana, lost his transmission at a rest area on I-10 in Florida and couldn’t be towed in until Monday morning. And Greg and Jan White had a front tire blowout on Interstate 40 in Arizona and had to be towed to Prescott. The gremlins chased us too over this past weekend while we traveled across Louisiana on I-10. We had a refrigerator problem that started on Saturday and couldn't get fixed until Monday. We used our GPS to get lost looking for a particular restaurant for breakfast. The coordinates were a half mile off and that put us a half mile down a narrow two lane road that took ten miles to find a spot wide enough to turn around. Later, while on I-10, an 18 wheeler blew a tire just as he was passing us. Threw alligators everywhere. Luckily none hit us. I did, however, pull off and do a walk around to check for damage. 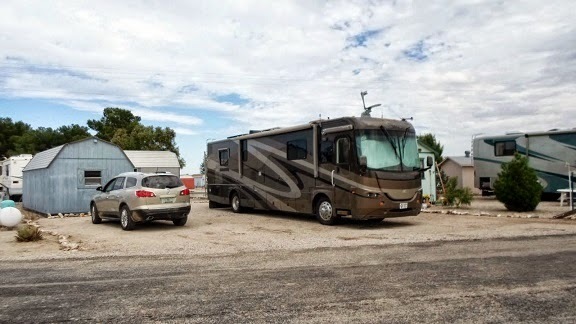 This morning, I got an email from our workamping friends Bill and Alicia Koegler, who are on the road somewhere between Texas and Virginia, saying that they are down with Toad transmission problems. All that got me to thinking about gremlins. How about some cartoon character to represent RV road gremlins? One that we can put in our blog posts to go with gremlin stories. That thought brought to my mind "Peter Pain". Remember him? 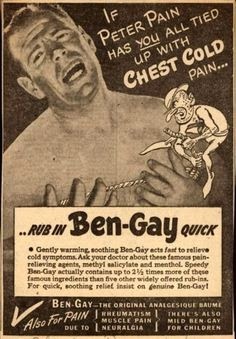 He was the cartoon character in old Ben–Gay print commercials. 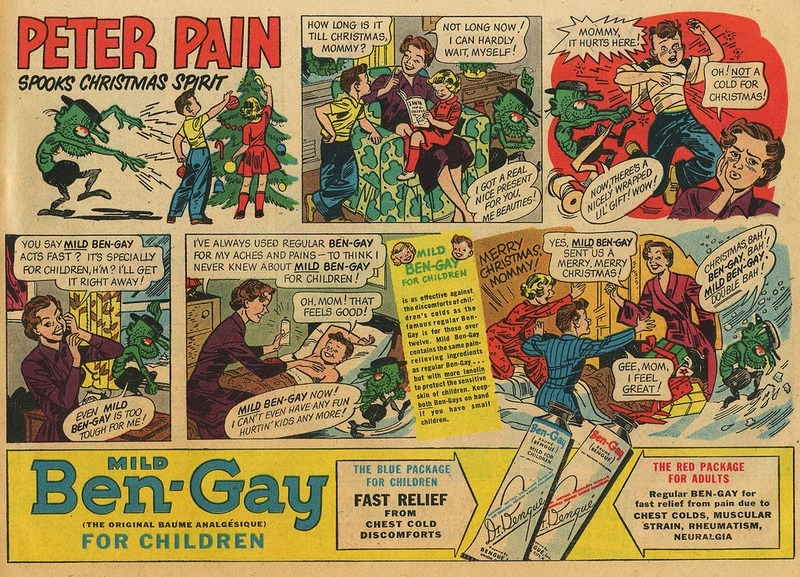 He was a green gremlin with a derby hat representing the pain that Ben–Gay would cure. A few minutes of searching on Google produced these old images. Could he be our RV road gremlin? 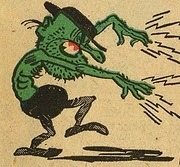 Does anybody have a better picture, a better gremlin, a name for this character? We can have some fun with this. Respond with comments, pictures, suggested names and let's see where this takes us.